Deluxe Systems will work with you to design a finished locker installation with any style locker you choose. Some installation options are shown below. Please contact us to discuss your requirements. Front and end bases are designed to fit between standard 6” legs. They present a clean flush appearance and prevent the accumulation of dust and dirt under the lockers. Front Base snaps in; End Base slips over legs during locker assembly. Only available for knocked down lockers with 6” legs. Zee bases raise lockers without legs 4” off the floor when there is no concrete or wood base. They provide a toe space in the front and a concealed flange for floor anchoring at the rear. A special 4” high rear leg can be ordered to support the back of the locker. (6” high zee bases are also available.) Zee bases are available only in 72” lengths, and may need to be cut to fit at the time of installation. 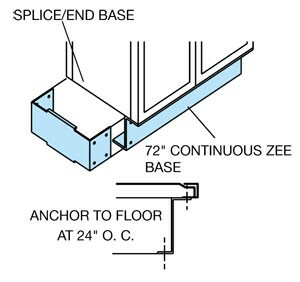 Splices/End Bases are used at ends of rows, and where the front sections join. Side trim for left hand (LH) and right hand sides (RH) are different. 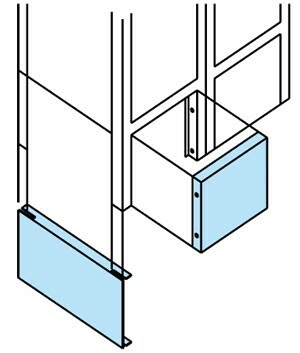 Side Trim comes in three types: 1) for use with lockers with no legs, 2) with 6” legs and 3) for use with Bottom Recess Trim. The soffit is to be constructed by general contractor. Face of soffit must be flush with face of locker. There should be 1” between top of locker and bottom of soffit. The recessed trim extends 3/8” from face of soffit. Top Fillers cover gaps between tops of lockers. They overlap the locker tops and can be field cut to allow for pipes, etc. There are separate designs for flat top vs. slope top, and in-line vs. corner applications. These come in three widths and are designed to be used in conjunction with Wall Angle Slip Joints for a solid fit and smooth finish. The slip joint conceals any raw edges caused by field cutting. Additional sizes are available.